It’s quite easy to spawn objects once you’ve set up a game. The general area to spawn in is under Objects -> Components. Components is where all the basic in-game objects are when you need them, from dice to RPG figurines, to tools, etc. 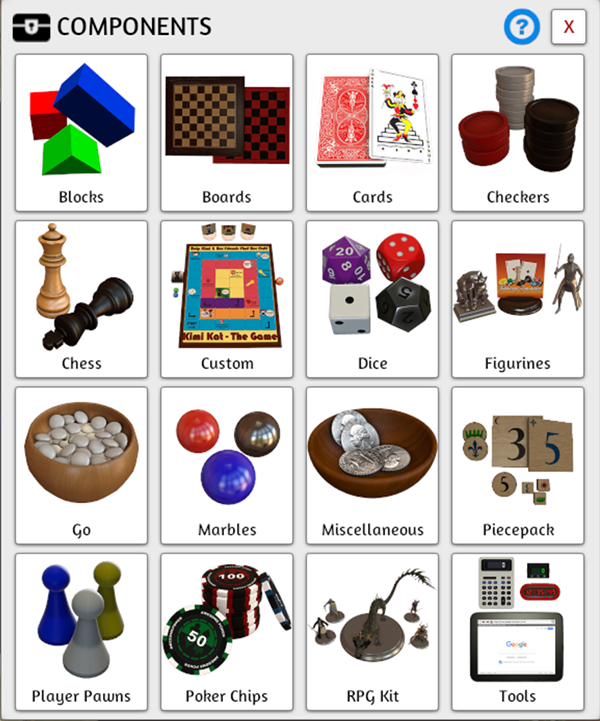 You will find objects in the Components that you may not find in the regular games. Components: To spawn an object, click on one of the categories. Similar to the games menu, when you click on a category, that section will now open up so you can choose from a variety of different objects within that category to spawn. Either click on one of the objects or drag and drop into your scene. Clicking on an object will spawn it in the middle of the table, while drag and dropping will allow you to place the object where you want. To get the best idea of where the object will spawn, bring your lift height down to zero. Saved Objects: To save an object, just right click on the object and click “Save Object”. A window pops up where you can name it. You can save it just like that or you can click the button above to save it to a folder. The default folder is your Root Folder. If you don’t have any folders to save it to, you need to click on Options -> Saved Objects to bring up that window. Then click the folder icon at the top. 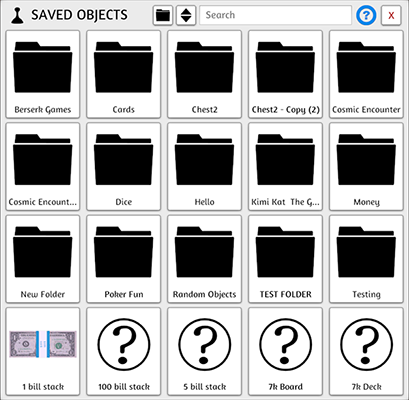 When you view your Saved Objects menu, this is the root area, so this is where you will see your folders and objects in the root folder. You can drag and drop any individual object or just click to spawn it on the table. Click on a folder to see what’s inside that folder. You can click the 3dots icon on the folders to either delete the folder or move it into another folder. Use the sort icon at the top to sort by name, updated, loaded or random. Folders will always remain at the top. 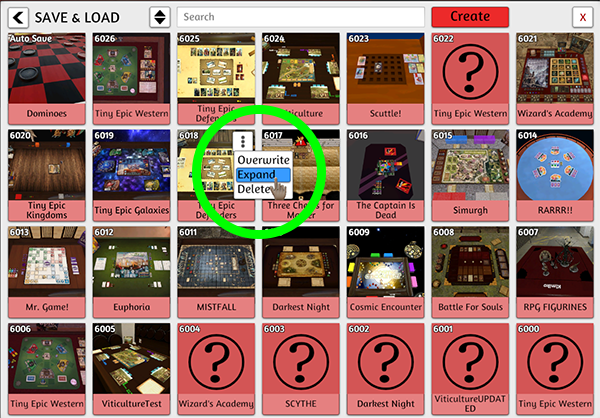 Workshop & Saved Games: You can also spawn objects from the Games menu from your Workshop and Save & Load categories. Just hover over the mod or saved game and click on the options icon (3 dots). Then choose expand to see what is in it and drag and drop or click to spawn the objects. If you click on an entire folder in the Workshop and Save & Load menus, it will just load the entire game, overwriting your previous game.